United States Mint sales of American Eagle gold and silver coins slowed in February, taking an expected break from the quickened pace in January when newly 2015-dated editions launched. Bullion coin sales happened in a backdrop of tumbling gold and silver prices with futures for the month falling 5.2% for gold and 3.8% for silver after scoring soaring gains in January. American Silver Eagles advanced 3,022,000, sliding 45.4% from sales of 5,530,000 in January and 19.4% from a year ago. The level marks the weakest February since 2012, although just 3 others are better since the series introduction in 1986. January through February sales of the 99.9% pure silver coins total 8,552,000, up a modest 0.3% from the same period in 2014. When the Silver Eagles ended last year at a record 44,006,000, the coins logged a starting two-month total of 8,525,000. United States Mint distributors still cannot order as many Silver Eagles as they want since sales are limited to keep up an inventory and to ensure even distribution. This Mint-imposed allocation system kicks in when demand exceeds supply. American Gold Eagles moved up 18,500 ounces, tumbling 77.2% from sales of 81,000 ounces in January and 40.3% from the February 2014 tally of 31,000 ounces. In year-to-date Gold Eagle sales, U.S. Mint distributors have ordered 99,500 ounces to register the slowest January to February start since 2008. American Gold Eagles are struck a 22-karat composition in four sizes — 1 ounce, 1/2 ounce, 1/4 ounce and 1/10 ounce. These correspond to denominations stamped on the coins of $50, $25, $10 and $5. All but the 1/4 ounce size advanced in February. The monthly no-show was the first since March 2012. February sales of 24-karat American Buffalo gold coin at 12,000 ounces match those from a year ago but fell 65.2% from January when buyers scooped up 34,500 ounces. Sales at 46,500 ounces this year are down 13.1% from last year’s two-month start of 53,500 ounces. The first 2015-dated America the Beautiful Five Ounce Silver Bullion Coin launched with the Homestead silver coin release on Feb. 17. This three-inch, 99.9% pure silver coins feature a design emblematic of Homestead National Monument of America in Nebraska. The U.S. Mint announced on Feb. 25 that its inventory ran out but that sales will resume on March 9. Figures have the Homestead silver quarter-dollars at 20,000 coins for 100,000 ounces. Great Smoky Mountains National Park Five Ounce Silver Coins sold out in October at 33,000. Shenandoah National Park Five Ounce Silver Coins sold out in February at 25,000. Arches National Park Five Ounce Silver Coins sold out in October at 22,000. Great Sand Dunes National Park Five Ounce Silver Coins sold out in December at 22,000. Everglades National Park Five Ounce Silver Coins sold out in December at 34,000. No five once coins had been available for sale last year February. Forthcoming 2015-dated coins will depict designs honoring national sites in Louisiana, North Carolina, Delaware and New York. Below are U.S. Mint bullion sales by product type. For comparative purposes, included are totals from a year ago and from last month. U.S. Mint bullion coins are sold to authorized distributors who resell them to the public and other companies like coin and bullion dealers. 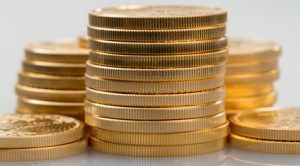 Bullion coins, whether gold or silver, are usually available for a few percentage points above the latest value of their precious metal content.